San Jose claims yet another national title, and this one is substantial. San Jose ranked as the top market in the country for Science, Technology, Engineering, and Math (STEM) jobs. Based on metrics such as percentage of total jobs that require STEM Bachelor degrees or higher, average salary, and overall salary, each market was given a particular score. 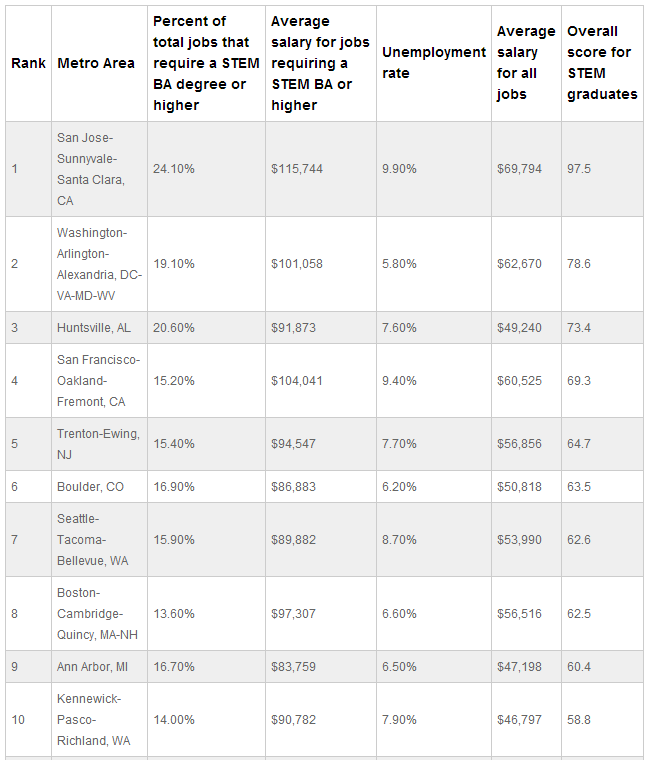 With 24% of San Jose jobs requiring a STEM degree, an average STEM job salary of $115,744, and a $69,794 average salary for all jobs... San Jose utterly destroyed the competition with an aggregate score of 97.5. Washington came in second place with a score of 78.6. San Francisco took 4th place with 15% of jobs needing a STEM degree and a $104,041 average STEM salary... meaning if you are looking for a STEM career you will make almost $12,000 less in San Francisco (without including the additional 2% in taxes you will pay for city-wide health insurance). The full top 10 list is below. The San Jose – Sunnyvale – Santa Clara metro area is a hub for STEM jobs in a variety of industries. As a major section of the Silicon Valley, the metro area is the headquarters for large technology employers like Intel, NetApp and Adobe Systems. The area also has high volumes of jobs in the manufacturing, healthcare and information industries. Santa Clara University’s School of Engineering offers high school students the chance to develop engineering knowledge with their SEED (Spring Engineering Education Days) and One Step Ahead programs. One Step Ahead is specifically designed to support female students in the GAINS (Girls Achieving in Non-Traditional Subjects)program. Despite being located in the political and governmental center of the US, the Washington – Arlington – Alexandria metro area is not just home to politicians and lobbyists. Plentiful and high value jobs in biotechnology, healthcare, computer systems design, software publishing, and science and technical consulting make it one of the best high-tech areas in the country. Large employers include Micron Technology Virginia, Computer Sciences Corporation, George Mason University and the Marine Corps Base Quantico. George Mason University’s STEM Accelerator program is dedicated to attracting and graduating more STEM majors in addition to helping them find employment in the STEM fields. Huntsville receives a significant amount of economic support from the presence of Redstone Arsenal, the Army missile program facility and the home of the Marshall Space Flight Center. Huntsville has strong science, technology, architecture, engineering, and computer and math sciences industries. 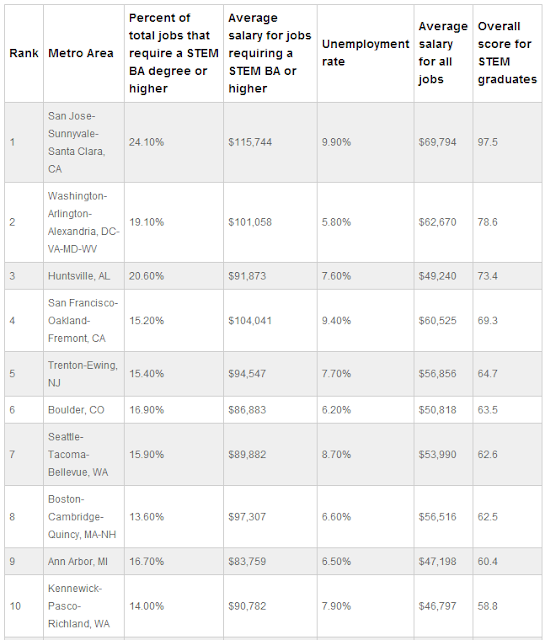 Known for its growing tech industry, San Francisco is a hotbed of STEM jobs. The local universities emphasize STEM as well, and UC Berkeley has clubs devoted to LGBT STEM communities and mentorship of women in STEM. With Silicon Valley nearby and SOMA just downtown, STEM grads will find plenty of tech companies to work with, including tech giants such as Google, Facebook, Dropbox and Twitter. Trenton was a major manufacturing center, and the city is now home to many government jobs. Trenton’s biggest employer is the State of New Jersey. The Center for Excellence in STEM Education has brought together a multidisciplinary team of educators, researchers and practitioners to determine STEM curriculum and learning techniques for pre-kindergarten through grade 20. Almost 17% of Boulder’s jobs require a STEM bachelor’s degree or higher. Boulder is one of themost educated places in the United States, and the Colorado Collaborative for Girls in STEM, funded by the National Science Foundation, encourages girls to pursue STEM careers. CU-Boulder has done groundbreaking research in student learning and curricular assessment through their Center for STEM Learning as well. Seattle is known for its clean technology, life sciences and healthcare industries, all of which attract STEM workers. The city educates its youth in STEM as well—the University of Washington runs Green Energy, a STEM camp for middle schoolers. For networking and coordination between STEM groups, Washington STEM is a great resource for holistic STEM education, both in the classroom and outside. Boston’s healthcare and research industries create a high demand for STEM expertise in the city. Massachusetts General Hospital is a top employer in the city, and the city is home to more than fifty colleges and universities, earning it the nickname “America’s College Town.” Boston’s colleges offer plenty of programs that enrich the STEM knowledge of local kids as well. Northeastern University runs a summer STEM program for middle school students, and MIT offers an innovative Women’s Technology Program that enrolls high school girls in a rigorous STEM summer camp. With the University of Michigan as Ann Arbor’s largest employer, it’s no wonder the city has plenty to offer STEM graduates. Ann Arbor also has thriving manufacturing, healthcare, automotive and biomedical research industries. This high-tech area also holds programs to enrich youth growing up in Ann Arbor—the M-STEM Academy at the University of Michigan allows outstanding K-12 students to take summer classes and offers stipends, research experience and internships. The Tri-Cities economy is largely based on farming, wine, healthcare and the automotive industry. The agriculture and healthcare industries require plenty of STEM knowledge, and the Washington State STEM Education Foundation has played a large role in emphasizing STEM education for publicly educated students. I like how they had to lump Fremont in along with Oakland and San Francisco. LOL, you got 4 counties (San Mateo, SF, Alameda, Contra Costa) vs 1 (Santa Clara). It always amaze me how large San Jose is, land-wise. San Francisco + Oakland + Fremont = San Jose . If there's anything we lack down here, it sure as hell ain't LAND.